The U 35 was ordered out on Mediterranean patrol in 1915. Its commander, Captain von Arnauld de la Periere, was a fan of the newly invented portable movie camera and decided to make a record of this patrol on film. The stills below are taken from a portion included on the They Sank the Lusitania episode of the CBS documentary World War I. The U 35 comes to the surface. The captain (light sweater) and his lookouts man the bridge atop the control tower. A merchant vessel has been spotted. The U-boat comes dangerously close to its prey. A crew will board the vessel to search for contraband. Captain von Arnauld de la Periere decides to sink the merchant vessel. 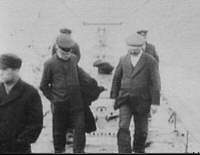 The crew is allowed to disembark before the sinking. The captain is allowed to board the U-boat. The rest of the crew will be left to fare for themselves in their lifeboat. The deck gun will be used in order to conserve the torpedo supply. The gun crew opens fire at the merchant vessel just below the waterline. More allied tonnage is added to the U 35's log book. The number of merchant captains would total eight by the time the U 35's very successful patrol came to an end.